There are a few basic items you will want to have in order to best care for and grow your orchid. These are items that you may even have laying around your house already or you can purchase quite cheap. One of the first things you will need is spray bottle you can fill with water. You may need to spritz your plant between waterings, especially if you live in a humid location. It is important to spray any roots that grow outside of the pot because they tend to dry out fairly fast, which could be quite harmful to the health of the plant. If your orchid is not receiving enough humidity, you might consider adding a humidity tray. These can be found at nurseries or you can even make one yourself. Simply, get a saucer or bowl and add rocks to the bottom of the bowl and fill with a little water. 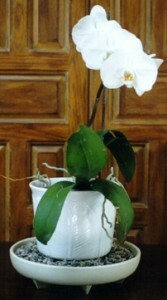 As the water evaporates, it creates humidity that is beneficial to the orchid. It is important to make sure that the roots of your orchid are not sitting directly in the water because this can cause the roots to rot. Also, you will need some type of cutting tool. You can use anything such as gardening shears, scissors, or a razor blade. The cutting tool will be used to remove rotting roots. 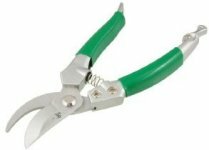 It is crucial that you sterilize your cutting instrument with either a lighter or rubbing alcohol each time you use it so that you do not unintentionally spread sickness or disease among your plants. Another essential is orchid fertilizer. There are numerous fertilizers on the market with several different nutrient ratios. It’s important to read the labels to find out which types of orchids you can use certain fertilizers on, although a 20-20-20 nutrient ratio is considered a general fertilizer to use on the majority of orchids. There are also several supplies that aren’t required although they are nice to have on hand. These supplies include items such as bamboo stakes and spike clips. A lot or orchids already come with a stake and clips when you purchase them, although it can’t hurt to have a couple extra on hand. If you want to go the frugal route, you can always use twist-ties in place of spike clips. Also, since your orchid must be planted inside of a pot with drainage holes, you may want to have a pot saucer in order to protect the surface that your plant will be sitting on from water damage and moisture. A bag of potting medium is also something that is nice to have on hand so that you will have it when it’s time to repot your orchid. As you can see, there are just a few basic tools and supplies that you will need in order to grow and care for your orchids. Growing orchids can be an inexpensive hobby that anyone can enjoy.